Though The Neighbourhood lacks a full makeover of a sound, the redundancy in their current melodies are used to their benefit. After years of quietly releasing live session tracks and solo projects, The Neighbourhood returns to the boyband arena. 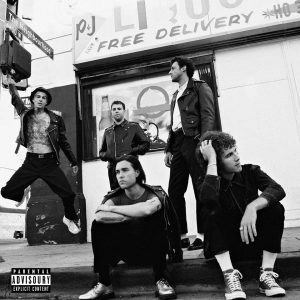 Their self-titled album The Neighbourhood (2018) released on Friday, March 8. It’s a conglomeration of new wave singles and songs pulled from previous EPs – particularly their Hard – EP (2017) and To Imagine – EP (2018). Likewise, they pulled from Hard to Imagine – EP (2018) as well, though this EP is literally Hard and To Imagine meshed into one, branded-new EP. A little overboard, but it lets their name be known. Songs like “Scary Love”, “Sadderdaze”, and “You Get Me So High” are dark anthems synthesized with reverbed vocals, pop clicks, crisp drumbeats, and echoing instrumentals. These act as the foundation for the album – they are key tracks that define what the group is best remembered for. Other tracks like “Nervous” and “Void” came out days before the album release. Such tracks offer similar tones and vernacular heard throughout the album. Let’s not forget that there were new singles released solely out of this album. Take “Flowers”, the first single. It’s a cinematic introduction to the album, which reconciles the band’s beach sound and sophisticated image. “Blue” is another one new to the ear. It’s a testament to Jesse Rutherford’s solo project & (2017), an album embraced by his tenor vocals and synthy hip-hop music beds. Though The Neighbourhood lacks a full makeover of a sound, the redundancy in their current melodies are used to their benefit. Typical distant guitar and static vocals are techniques they manage to get away with. Much of their interludes and existential sounds are drawn from characteristics found in previous albums – say Wiped Out! (2015) and #000000 & #FFFFFF (2014). The album as a whole is no showstopper. However, it does reclaim the band’s territory in today’s independent artist game, ultimately gratifying long-time fans and impressing new ones. Feature Photo By (The Neighbourhood/Facebook).